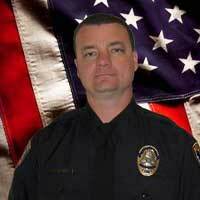 The Santa Clara Police Officers' Association expresses its deepest condolences to the family of Officer Michael Crain of the Riverside Police Department. After high school, Mike attended Crafton Hills College in Yucaipa for a year prior to enlisting in the United States Marine Corps. He served two deployment tours in Kuwait as a rifleman in the 15th Marine Expeditionary Unit, 3rd Battalion 1st Marines. He was a squad leader, and was promoted to the rank of Sergeant. He was then stationed in Camp Pendleton in Oceanside, CA, where he taught Military Operations in Urban Terrain. During his military service, Mike was awarded the Good Conduct Medal, the Armed Forces Expeditionary Medal, the Sea Service Deployment Ribbon with 1 star, a Certificate of Commendation, and the Rifle Marksmanship Badge. After being honorably discharged from the Marine Corps, Mike joined the Riverside Police Department. He graduated from the Riverside Sheriff's Academy, class #152, and was sworn in as a Riverside Police Officer on August 24, 2001. Mike had a big heart, and enjoyed spending time with his wife, Regina, son, Ian (age 10), and his daughter Kaitlyn (age 4). He loved attending dance recitals with his daughter and coaching his son's baseball team. He also loved his classic 1970 Chevy Nova, which he spent his spare time restoring. Mike's family and friends knew his usually straight face hid a huge personality. He made an unforgettable impression on everyone he met.